Is there anything like the smell of warm apples and cinnamon wafting from your oven or stovetop to make it feel like Fall? If you’ve been craving a lighter way to get the flavors of hot apple pie and you want your kitchen to smell like a slice of Heaven, then these Mini Cinnamon Apple Tarts are for you! The wonton wrappers are coated in cinnamon and sugar and get crispy in the oven for a satisfying crunch. They’re then filled with warm, gooey, homemade apple pie filling that oozes out with every bite. The best part is that these treats come together quickly and each tart is only 45 calories or 2 Weight Watchers SmartPoints! I brought these to a girls’ night with some friends this weekend and they were a huge hit. Bring them to your own Fall gatherings and watch them disappear! Pre-heat the oven to 350. Lightly mist 24 cups in a mini-muffin tin with cooking spray and set aside. In a small dish, mix together 10 teaspoons (3 tablespoons + 1 teaspoon) of sugar and two teaspoons of cinnamon. On a sheet of parchment paper or a clean surface, lay out the wonton wrappers. 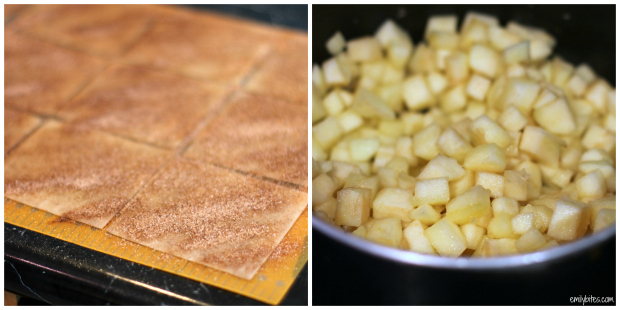 Lightly mist the wrappers with cooking spray and then sprinkle each with ¼ teaspoon of the cinnamon sugar mixture. Flip each wrapper over and mist these sides with cooking spray as well. Sprinkle each with another ¼ teaspoon of cinnamon sugar mixture so that both sides are coated. Push each wonton wrapper into a slot of the muffin tray to form a cup. Bake in the oven for 8 minutes until brown and crispy. While the wonton cups are baking, bring the butter to medium heat in a medium saucepan until melted. Add the apples and stir to coat. Cook uncovered for about 5 minutes, stirring occasionally. In a small dish, combine the remaining 3 tablespoons of sugar and ½ teaspoon of cinnamon with the cornstarch and stir together. Pour this mixture and the water over the apples and stir to combine. Place the cover on your saucepan and once the mixture is bubbling (shouldn’t take long), reduce the heat to low and simmer for 3-5 minutes until the mixture thickens and the apples are tender, but not mushy. 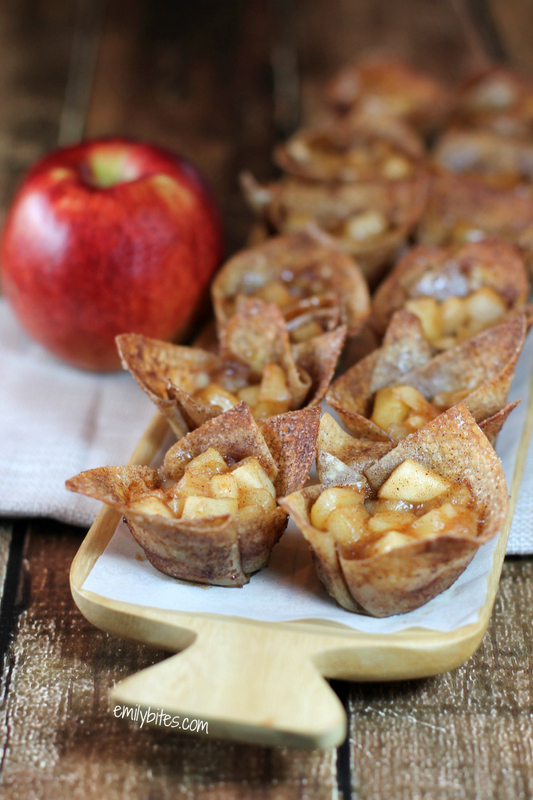 Spoon the apple mixture evenly into the baked wonton cups and return them to the oven for another 3-5 minutes. Your timing is just perfect- we picked a TON of apples recently, and I needed a different recipe than my usual apple go-tos! Perfect! Hope it’s a hit! These look delicious. I think I might make a few with a dab of light cream cheese or Light Laughing Cow under the apples. Can’t wait to try it! Thanks Emily. Yum, hope you love them! These look awesome, I can’t wait to try them! Do you know how well they keep? I would love to be able to do these the day before I need them. Thanks! They are definitely best the day they’re made because the wontons can lose their crispiness. If you have to make them the day before I’d suggest not filling the cups and storing separately (filling in fridge, cups uncovered on counter) and then filling them before serving to avoid potential loss of crispiness. Hope that helps! I would love to know how long these would keep! I have an event on Saturday but would need to make these Wednesday or Thursday. Would they keep that long? Thanks! Hi Liz, I just responded above, but I think it would be tough to get the same texture several days later. You may be able to make the wonton cups and filling and store them separately to combine before serving – may improve results. I’m cubing presliced apples. Do you have a guess how much in terms of cups that would equal for 3 medium apples? I’m sorry, I didn’t see this in time and I’m sure you’re probably done cubing by now :/. I didn’t measure it in cups, but I just googled it and found that a medium apple equals 1 cup when finely chopped/diced. Hope that helps! I am so excited to take these to my book club meeting on Sunday. A bunch of us from this group just went apple picking together so it will be fun to share the fruits of our labor (literally!). 🙂 And at 1 PPV per tart how can you go wrong? Love, love, love your blog and recipes, Emily! These are amazing! 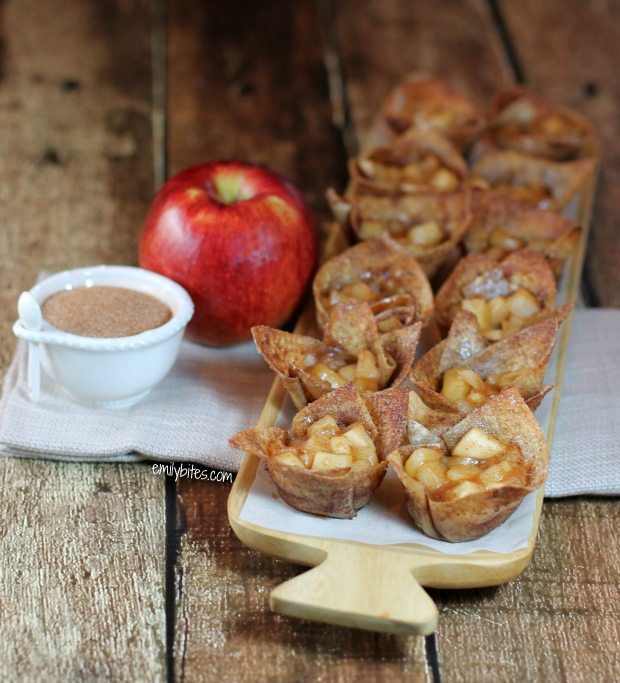 I just made them tonight and it tastes like mini apple pies only better. I added a little fat free whipped cream and will be making this again over the holidays. I’m so glad you loved them, Erica! What type of apples are best for this recipe? Hi Emily, I’ve used Honeycrisp and Empire and both worked great! These are delicious – but definitely must make the day of….the next day the bottoms are soft. Day after that….a soggy mess! How many points would these be if you used a regular size muffin tin? I am going to try to make these next week! Do I need a mini muffin tin or will a regular muffin tin work? Can’t wait to try them! Adorable! I made them tonight in regular sized muffin tins with a little aluminum foil packed in each cup to make it a little smaller. I used one apple to make 6 mini tarts (there was plenty of other dessert, but I wanted something other than cookies and brownies for the 4 adults). Quite delicious! Everyone agreed the wonton wrapper made it a very interesting dessert. The apple filling was perfect. Can you calculate this for SP? Oh how weird, I thought I’d already posted that but it’s not there! they’re 2 SPs each. I will edit the post. Thanks! I made the apple tarts for a NYE party, and they were a big hit. My hubby is already wanting me to make more! Hi! Do you think you could make these with peaches as well? Can you substitute stevia for the sugar? If so, do you know if it’s a 1:1 exchange? I’m not sure, I haven’t used stevia. I’m guessing that their packaging probably has a conversion chart? I think sugar substitutes are often stronger than regular sugar so I would check. Made these for a group picnic. Changed the apple part a bit. Bought some canned apple pie filling. Didn’t look appetizing and was too sweet for me. I peeled and cubed up some fresh apples. Added some lemon juice to my taste, then finished the pies in the oven. Everyone loved them! I will try this sometime with cherry pie filling and frozen tart cherries added! Yummy good and for 2 points!! Love them. Can’t wait to try the apple cinnamon wonton recipe.